How Can We Improve FeePod, Our Premium Membership System? hi everyone.. welcome to the chat event! Glad to be here. Thanks for doing this! here's your chance to tell us exactly what you want, Rich. $1 million dollars on $100 dollar bills...Oh no...not the right place for that! I would like to have the option of customizing the renewal email message and the pop-up bannner. The current message is generic text and is branded with the Hoopla logo. I understand that you are justifiably proud of the Hoopla platform and want to promote it as much as possible. I get that. However WE are proud of OUR logo and product, too! And we want to promote our brand in this renewal process. Our Hoopla forum has become the "face" of our business. We are on the Pro Package and our own Hoopla server. We serve around 5 million pages a month there, to around 70,000 unique visitors. When we send renewal emails to our members, I would like to be able to fully customize the message, with our logo and whatever we want to put in the message. If the Hoopla logo appears at the bottom of the page, that's fine, but I would like to be able to "brand" our renewal message with our company logo and specific sales message. Same with the promotinal pop-up window. Copy and paste...it's a wonderful thing. How about more customization that just the header and footer -- the actual wording would be nice. Yes, I understand the need to make sure our members know who is billing them. I agree with Carol, we need more ability to customize our SALES MESSAGE, not just the header and footer. Yes, I'm OK with the invoices. It is the reminder emails that I want to be able to customize more. The Premium Memeberships on our site are a BIG pathway to growth for us. In may ways, we are tightly tied to Hoopla for our future on-line success. Ok - next....Join" and "member" community-oriented language seems at odds with marketing/money language of "purchase" and "premium" and "upgrade." In order to manage that growth, we have to be able to control the message we send to our members. ITEM 2 - customize the pop-up window. Thanks for being the secretary Rich! Which pop up window are we speaking of Rich? We have the same issue ther in that it is a generic message that we would like to be able to fine-tune to OUR sales message. What is the current cost for the feepod if you only want to do a one time charge... like a lifetime membership. Hi, LanceOwners: you mean the cost to you as the site owner? I mean what is the split. Is that the one that we have set to show up as soon as someone visits the site? We call it the nag screen. So followup question...do you want to customize just the text or the colors/graphic as well? thanks Lori. Just so I am clear... the 25% goes to SS? Uh...make that EVERYTHING. No spell check..
waht about reporting.. any thoughts on taht? Seriously, the graphic background is fine, but the window size is fixed, so the messagee has to be carefully tailored to fit the window. Can we change that? That screen is where I was talking about: Join" and "member" community-oriented language seems at odds with marketing/money language of "purchase" and "premium" and "upgrade." So just let us customize the whole thing. What sorts of data would you like to report out? I would like to be able to see stats on renewals, adds drops, dates, etc. This is an area that neeeds a lot of work. I am in the dark as far as being able to determine who has renewed and who has cancelled. like a transaction ledger? what format are you looking for? If I could see the people who were members and had NOT renewed, I could send them a special message with some kind of a freebie to get them back. Can we select the data? Like how many fell off (didn't renew) in a certain time period. For example do you need to export the data to CSV, or do you just want to be able to sort in the Manage Members area? If you could make the data available and viewablee on-line as well as via download, that would be ideal. I could write something here in Filemaker Pro to do something with the data after I get it. CSV would be fine. The bottom line is that I would like to be able to see who renewed and who didn't so I can market to those folks who chose not to renew and get them back. I would also like to be able to pull up a list of those who had recently joined and then say a month later became a Premium member. Or be able to THANK them for becoming a premium members. What field data do your store on Premium Members? And to be able to tell the difference between someone who is new and who is renewed. To refine my question, do you store only CURRENT data or is there a history being built year to year? Yes...new purchase versus renewal data would be good. from a premium membership standpoint, it sounds like there are two different ideas in play here: 1) a transaction ledger and 2) a list of recently expired memberships (which wouldn't be immediately obvious from a transaction ledger alone). is that an accurate assessment? Yes, Brian. BOTH would be valuable, in different ways. 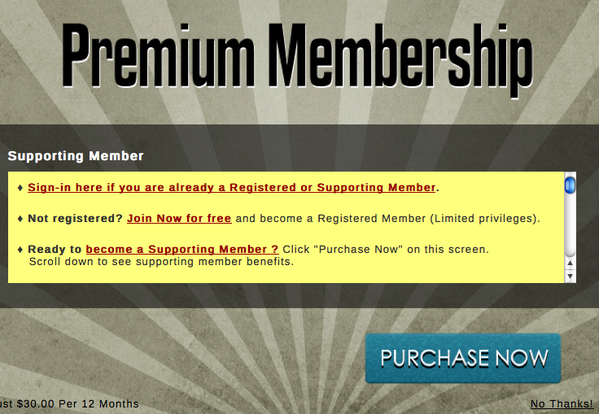 I would like to know who was a premium member and then expired but then 5 months later signed up again. Any way to know that? A transaction ledger would be current and historical data, would it not? Because I'd like to be able to word the thank you differently for someone who had essentially renewed - even if it was 5 months late. If you have access to that data, I think that would solve a lot of reporting issues. Yes but would I have to look through stacks of data or could I do a query search on it? Perhaps you could build in some queries done via the browser for various ways we need to search the data. Would like to be able to see trends. Upcoming renewals, expiration in the last 10, 30, 60 days, etc. I assume the biggest need then would be to have an email list generated based on those paremeters, right Rich? I would prefer a full data dump we could download. Just an email list will not have all the information we need. Or the option of both? Yep...CSV format data PLUS and email list. Maybe the option to chose which while on line? There could be times when just an email list is enough, while other times more data would be neded. It would perhaps be nice to be asked -- hint, hint -- "here is what we are planning to put into the CSV, is this enough?" My typing is getting bad...sorry. Going too fast! My only chance? Such pressure! And on a Friday afternoon! I would like to see ALL the appropriate filed in the CSV file. Names, dates, emails, etc. do you all care about paypal support? It would be better to have more data than we need as opposed to missing one critical piece of info. Yes, I think that would be very helpful. How would Paypal work in terms of paying us? How does PayPal mesh with the way you handle the renewals automatically? Okay. then it would be nice to be able to pay using paypal. OK...just not all that familiar with the details behind PayPal. If you can code that in so members could use PayPal, that would be a significant and positive change. That may solve the cases where we get a church without a credit card. It also gives us something "new" to sell to our non-premium members. Okay, so Mr. Secretary, where are we? Ready for another topic? I've had people "join" thinking they were going to be a premium member, but the process obviously didn't close the deal. "Upgrade" to Premium membership should be offered immediately. Strike while iron is hot! yes, you already have a suggestion for that i believe, right, Carol? I loose track of our suggestions (lol). You guys incorporate our suggestions so fast into the Hoopla code that we don't have time to complain about them! thanks rich.. sorry we cannot incorporate everything you all want even faster.. lots on our to-do list! It's giving you a reason to get out of bed in the morning. I think it needs to more than just a link. It needs to be a site-specific sales message so we can tell the prospective custoemr exactly what he gets in his Premium Membership. Every site will be different in this aspect of things. another question for you: do you care about being able to track google ad words (or similar) conversions? It would be nice to have a couple of different premium membership "Descriptions." The one we have is too long. It's like we need to have access to a shorter version. Yes, it could, however we are talking about a different "target audience" here, so to speak. This will be an impulse buy, so the sales message should be different than the on-going promo message in the pop-up. I don't know enough about Google Ad words to know how to answer that. We already have Google Ad words reporting from Google. What would Google Ad Words do for us? I don't know enough about those stats (the conversion of clicks to purhcases) have to ask Neil. THough it sounds nice. If they type "railroad" where? Are you a non-profit Rich? OK...where does Hoopla fit into that picture? Sometime it seems like we are non-profit, but no...we are a for profit business. OK...I just don't know enough about this right now to have an opinion about it. We are a non-profit so we signed up for a google grant and get so many ad words a month for free. I can't believe our hour is almost up! We sell client-specific banner ads on our forums, but have never used any other ad source. This has been a VERY GOOD exchange of information. What should our next chat be about? Can I bring up one more thing or am I out of time? About the $ sign icon. $ icon denoting premium content seems to create an "asking for money" feeling. Want more community-friendly-warm-fuzzy-ness. yeah it's awesome isn't it"
What would you use, Carol? There's something else we could customize! You guys are awesome for taking the time to come share your ideas, thank you! I guess that about covers it. I have to thank YOU FOLKS for this. I have never worked with a Tech Company that was so focused on its customers. I come from a background of customer support in a software company... and what you all do is awesome! and thanks for your extreme bug extermination skills too! You're welcome, Ted. You can take the rest of the day off. alright.. Happy New Year everyone! Give us feedback about improvements we can make for FeePod, the premium membership system for Hoop.la and UBB Forum.